In May 1917, the Finnish parliament passed a food bill prepared by the Senate. The Russian provisional government confirmed the law in early June. The law allowed for rationing and requisitions. It was applied to cereal products, which provided Finns with more than half of their total energy requirement. The Finnish Senate began to enforce the law on 5 June 1917. The Senate, led by Oskari Tokoi, had begun drafting the law as soon as it had assembled in late March. The necessity of the law became painfully obvious as the food situation deteriorated rapidly during the spring. Cereal, in particular, was in short supply. At the end of 1916 and the beginning of the following year, a rationing card system was introduced for sugar, dairy products and meat. The authorities also introduced price ceilings for different products. Rationing of cereals was not yet deemed necessary. However, the situation changed rapidly during the winter of 1917. In normal times, average grain consumption in Finland was about 600 grams per person per day. Bread and cereal products were the main source of nutrition for ordinary Finns. They made up nearly 60 per cent of the total energy intake. Domestic production accounted for less than 40 per cent of the country’s grain demand. When imports from Russia stopped almost completely in the spring of 1917, rationing became a necessity. The Act allowed requisitions, which was a violation of people’s rights to private property, so the bill had to be processed according to the procedure for constitutional enactment. The parliament declared the bill urgent and passed the bill with 177 votes for and 6 against. After the enactment of the food bill, the Senate issued decrees concerning the introduction of rationing. On 5 June, it prohibited the use of food crops as animal feed. On the same day, the Senate issued a decree on arranging the consumption of food grains during the summer. By that decree, the government declared the food grain stocks requisitioned as of 17 June. The decree applied to wheat, rye and barley stocks, as well as bread and groat stocks, which the government thus requisitioned. The requisition order applied to all cereal stocks larger than 4 kg, and all groat stocks larger than 3 kg. According to the Senate’s guidelines, the daily ration of cereal products was 150 grams for those doing light work, 240 grams for those doing medium work and 300 grams for those doing heavy work. The municipal Food Boards had to find ways to keep the consumption within the prescribed limits and obtain grain for the municipality if there was a lack of it. However, the distribution of scarcity did not succeed according to plan. The municipalities did not want to give their surplus grain to other municipalities, but rather preferred to distribute it to their own residents. The Finnish Senate launched efforts to re-establish the import of cereals. In principle, it should have been possible to re-establish the Russian imports, as the Russian provisional government had declared the provincial grain stock a national asset. In practice, however, the provisional government did not have enough muscle to force the provinces to surrender their grain. Imports to Finland increased in April, but then dropped to one to two million kilograms per month. The grain deal was also hampered by the tense relations between the provisional government and the Finnish Senate, caused by the dispute over Finland’s status. The Senate tried to buy grain from Russia. On 27 June, it signed an agreement with the provisional government on a delivery of 62 million kilograms of grain to be made between July and October. The provisional government needed money to maintain the Russian troops in Finland, so the payment of 60 million Finnish Markka was to be made in advance. The Senate agreed to the advance payment because they thought it would put pressure on the provisional government to speed up deliveries. That was, however, not to be. The provisional government, which suffered from a shortage of Finnish currency, spent the money to pay their troops, but the grain deliveries to Finland shrank. Equally misfortunate were the Senate’s attempts to obtain grain from the United States, even though these purchases, too, were paid for in advance in the summer. The amount of grain purchased was equal in size to that purchased from Russia. Transportation difficulties and the increased involvement of the United States in the World War postponed the delivery of the grain, which was already at ports waiting to be shipped to Finland. In the summer of 1917, there were about 100,000 Russian troops in Finland who used the scarce food resources more than could have been expected on the basis of their head count. In practice, the rationing did not apply to Russians. The idea was that the troops would obtain their grain from Russia and other foodstuffs from Finland. However, the grain deliveries were reduced in the summer. Rationing did not affect the troops’ meat consumption. The average monthly intake was over five kilograms of meat – a little under 200 grams a day. Finland’s military and political position was so precarious both internally and in relation to Russia that the Senate did not dare to significantly reduce the troops’ rations. Neither did it put an end to the requisition of beef cattle, although the idea was discussed. Unauthorised requisition by the Russian troops increased in the summer. This was due to a lack of discipline but, on the other hand, the commanding officers would often turn a blind eye to such activities. The Food Boards were also responsible for the provisioning of the troops. Feeding the soldiers caused shortages of meat and dairy products in particular. The authorities were forced to reduce the daily rations of cereal products in December and January. The standard ration was 200 grams of grain per day. You could also obtain a card for an additional 100 grams. A considerable part of the ration consisted of oats. In December 1917, it was hoped that the declaration of independence would help Finland obtain more grain from both the United States and the neutral countries. However, the United States feared that the grain shipments might fall into the wrong hands. In November, the American “food dictator”, Herbert Hoover, suspended negotiations for grain deliveries to Finland. In December, the Allied Powers reassessed the situation. Allied diplomats recommended grain deliveries to Finland so that the public opinion would not grow more favourable to Germany in the newly independent country. In mid-December the US government did re-establish negotiations on the delivery of cereals to Finland. In January, the diplomats again recommended that food should be shipped to Finland – this time, in order to prevent unrest and to combat the influence of the Bolsheviks. However, Finland did not agree with the political conditions outlined by the Allied Powers. Finland’s assessment of the situation was apparently influenced by the peace negotiations in Brest-Litovsk between Germany and Soviet Russia, which increased the hopes of getting food aid from Germany. Imports from the Allied Powers became impossible when the civil war broke out at the end of January 1918. The supply of grain from Russia also ran out almost completely. This did not come as a surprise to the food authorities. The local Food Boards had received circulars urging them to prepare for the fact that the country would have to become self-sufficient in terms of food. After the declaration of independence, it was in principle possible to influence the presence of Russian troops in the country. During the autumn, troops had been transported out of Finland and some had left on their own. However, at the turn of the year there were still approximately 40,000 men in the country. The maintenance load had been reduced to less than half of what it had been, but it was still difficult to feed the troops. Immediately after the declaration of independence, the Finnish government was in no particular hurry to order the Russian troops to leave. Officially, Russia still belonged to the Allied Powers, from whom Finland was hoping to receive food aid. However, the Finnish government did point out that the Russian army used the country’s scarce food resources and caused insecurity by their lack of discipline. During and after the civil war, Finland’s poor food situation deteriorated further in 1918. Many Finns suffered from malnutrition. The worst off were the poor people living in Eastern and Northern Finland and in the country’s largest cities. The food offered to the Reds in the post-civil war prison camps was extremely scarce and of poor quality. 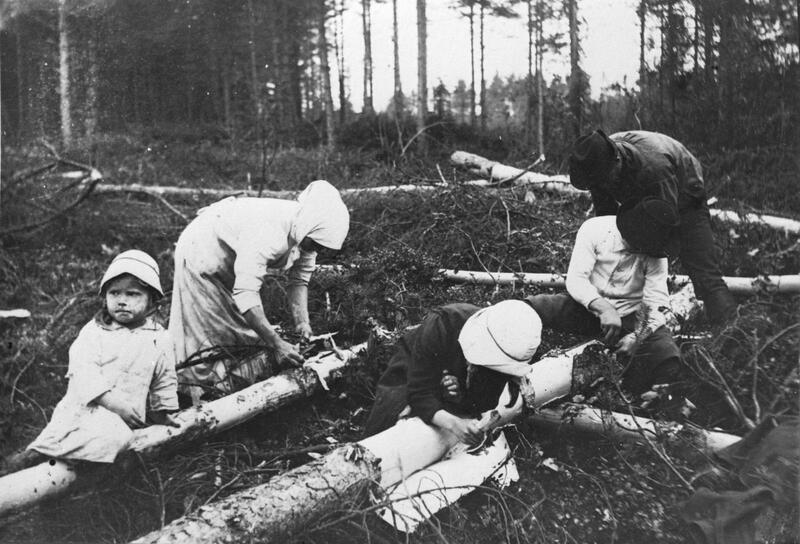 In the province of Kainuu, people had to resort to wood bark (pettu) to make bread. In the spring and summer, rationing had to be further tightened. The amount of grain that you could buy with your food coupon was only a tenth of the daily need. The dire situation temporarily improved after the harvest, but already it was known that the Finnish stocks were too small to last over the winter. The imports had been cut off and, according to estimates, the domestic production would feed people until early spring 1919. The end of the World War brought no immediate relief. The embargo imposed by the Allies on the Central Powers continued after the German surrender in November 1918. At France’s insistence, the embargo lasted until the beginning of March 1919. Initially, Finland, where the German influence in the late stages of the war had been strong, was hit by the embargo with full force. Gradually, the embargo was lifted, and on 24 February 1919, Finland was classified as a neutral country and had its foreign trade restrictions removed. Even before that, Finland had received large shipments of grain once Herbert Hoover had been convinced that they were absolutely necessary. The situation improved in the spring of 1919, when regular grain shipments started with the help of a loan from the United States. These shipments saved Finland from imminent famine. Punctual payment of the instalments of the American loan during the economic depression in the 1930s improved the image the Americans had of Finland. Based on the lessons learned from the First World War, Finland began to improve food self-sufficiency and increase security stockpiling. Rationing did not succeed in completely balancing consumption between different population groups and regions, even though coupon-based distribution resulted in a better outcome than unregulated consumption. Generally speaking, the countryside was in a better position than the cities. Regional disparities in the availability of grain were heightened by transport difficulties. The situation in Finland varied considerably region by region. In the largely agricultural and self-sustaining municipalities of Southern and Western Finland, the impact of food shortages was low, and people did not starve. In contrast, a significant proportion of the population in the larger towns of Eastern and Northern Finland suffered from malnutrition.